Under the influence of the October Revolution, the Communist Party was founded as the Comintern party in Brazil in 1922, being also Brazil's oldest party. The Soviet-Chinese split led to the partition of the party and the establishment of the pro-Chinese PCdoB in 1962. When the military regime came to power in 1964, the PCdoB carried a guerrilla struggle for many years. Only after 1988 did it find the opportunity to legally carry on its political activities. In 2003 the PCdoB allied with the Labor Party and has preserved its alliance since. During the general elections in 2010, 15 MPs of the PcdoB got into parliament with 2.89% votes and in 2014 it won 10 seats with 1.98% votes. The congressional theses titled "The Broad Front: The New Path for Brazil - Democracy, Independence, Development, Social Progress" was followed by a broad international delegation. 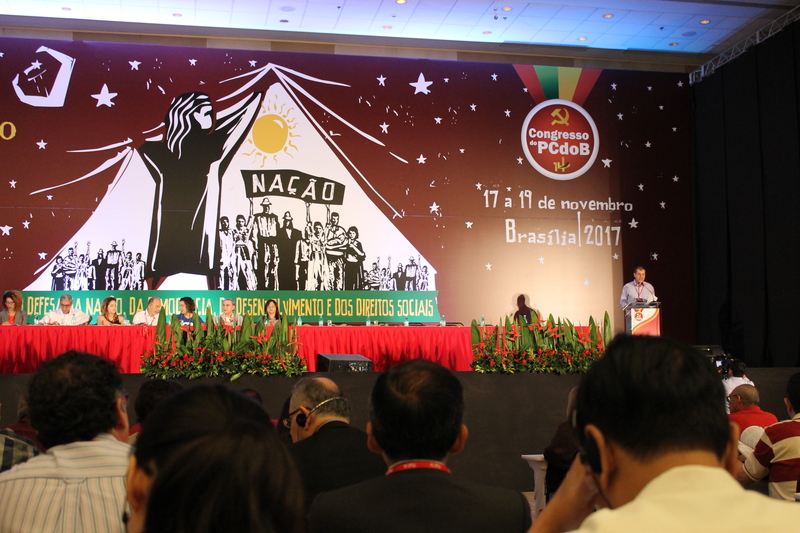 Dilma Rousseff greeted the Congress with a message and the closing session was attended by Lula da Silva who also made a speech. The Congress resolved on continuing the alliance with the Labor Party and decided to nominate a female candidate (Manuela D'Avila) for the presidential elections in October 2018. The Congress ended with the election of the Central Committee.